The Republican political strategy has been to obstruct efforts to help the economy for everyone but the wealthiest few, and then campaign on complaints that the economy isn’t helping anyone but the wealthiest few. It’s working. 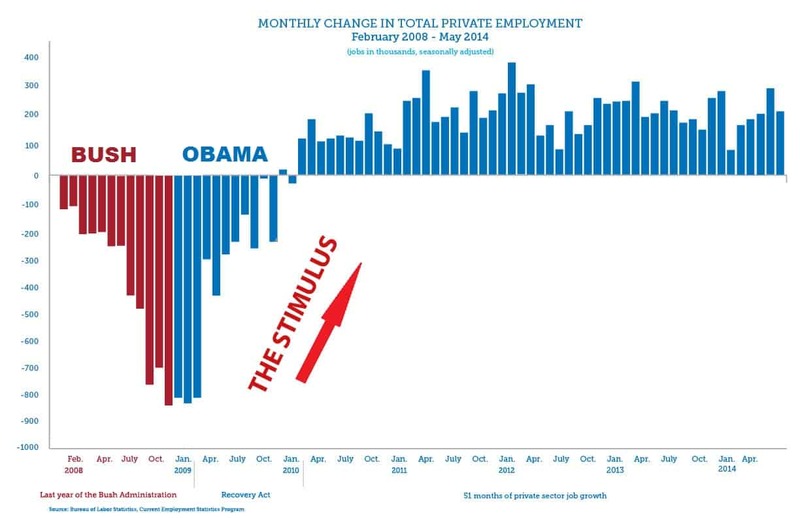 In President Obama’s July 12 weekly address he said, “So far this year, Republicans in Congress have blocked every serious idea to strengthen the middle class.” He could have said, “Since 2009.” Since the 2009 “stimulus,” Republicans have obstructed pretty much every effort to help the economy. In the Senate they have filibustered hundreds of bills, and since the “stimulus” they have managed to keep anything from passing that might help the economy. In the House, Republicans have refused to allow votes on anything that seriously would help the economy, instead passing only tax cuts for the wealthy and corporations, spending cuts on essential things like maintaining our infrastructure and scientific research, and cutting regulations that protect people and the environment from being harmed by corporations seeking profit. Republicans have blocked every effort since the stimulus to maintain infrastructure, hire teachers, raise the minimum wage, give equal pay for women, stop special tax breaks for millionaires corporations (especially oil companies), stop tax breaks for sending jobs out of the country, provide student loan relief, help the long-term unemployed, and more. Instead they insist on even more tax breaks for oil companies and billionaires, on cutting environmental protections, deregulating oil companies, and so on. That’s what it means to have a 60-vote Senate, which is what Minority Leader Mitch McConnell and the Republicans declared as soon as Obama was elected. Almost every measure and, until Majority Leader Harry Reid and the Democrats invoked the nuclear option last fall, almost every nomination, had to have 60 or more votes to pass. That’s a filibuster. Teachers and First Responders Back to Work Act of 2011 – rehire 400,000 teachers, firefighters, paramedics and police officers. What would it have meant for the economy and jobs to launch a post-stimulus effort to maintain and modernize our infrastructure? How about reversing the tax structure that pays companies to move jobs out of the country? How about equal pay for women? How about a minimum wage increase? How about hundreds of thousands of teachers and first responders going back to work? How about being able to organize into unions to fight for wages, benefits and safer working conditions? How about relief from crushing student loan debt? Of particular note among the passed bills is the Republican “Path to Prosperity Budget” (a.k.a. the “Ryan budget”). It is described as “Cuts spending & implements pro-growth reforms that boost job creation.” It dramatically cuts taxes on the rich. It privatizes Medicare. It cuts spending on infrastructure, health care for the poor, education, research, public-safety, and low-income programs. It turns Medicaid, food stamps, and other poverty programs into state block grants. Tax cuts aren’t going to fund schools or repair roads and bridges. And lo and behold, this Republican budget that passed the House cuts taxes and cuts funding for even maintaining – never mind modernizing – our vital infrastructure needs. This is a budget of economic sabotage. Approve Keystone pipeline, to build a pipeline across the country so Canadian oil can be soil to China, easing an oil glut here and bringing prices back up. North American Energy Infrastructure Act – promotes cross-border pipelines. OK, got that? Their “jobs” bills include things like cutting government support for schools, stopping regulations on coal ash, requiring people receiving federal assistance to work, and drill-baby-drill. Oh, the list even includes bills that Republicans filibustered in the Senate. Many of these so-called “jobs” programs are really about subsidizing and assisting the oil and coal companies that provide so much of the funding for the Republican Party and conservative propaganda apparatus. (Note that Koch Industries is at heart an oil company.) They’re just called “jobs” programs because people need jobs – because Republicans have been blocking actual jobs programs. And what about direct sabotage? Who can forget the Republican hostage-taking of the debt ceiling, when they threatened to take down the entire world economy unless we cut back on things like maintaining our infrastructure, scientific research, public health, hiring teachers and other things we do to make our lives better? There was a direct cost of $18.9 billion, but then there was the resulting credit rating downgrade, the pullback by businesses worried that they might actually do this, and so on. Who can forget the terrible cost to the economy of the government shutdown? There was a direct cost of $24 billion, but also the reduced fourth-quarter GDP growth from 3 percent to 2.4 percent. And the continuing harm from loss of confidence in our government’s ability to, well, govern. However, the voting public is largely unaware of this record of obstruction and sabotage and the effect on the recovery. Seriously, go out and ask around. If you are reading this you are likely a highly-informed person. So you might be aware that there have been filibusters, but maybe not that there have been up to 500 or more Republicans filibusters. If Republicans take the Senate this fall, will they continue the obstruction and sabotage? What if they later also take the presidency? Here’s the thing, they know their tax cut, deregulate, smaller government nonsense does not work to boost the economy. Any economist will tell you, history will tell you, and common sense will tell you that taking money out of the economy won’t help the economy. It’s bad enough now, what happens to the country if they win? It’s well past time to be fed up with this. Vote, make sure your friends and family vote. Volunteer to talk to people about the urgency of voting. It’s all we have left.